Scorpio Bulkers Inc. reported its results for the three months and year ended December 31, 2018. The Company also announced that on January 25, 2019, its Board of Directors declared a quarterly cash dividend of $0.02 per share on the Company’s common shares. For the fourth quarter of 2018, the Company’s GAAP net loss was $7.4 million, or $0.11 loss per diluted share. These results include a non-cash loss of $7.7 million and cash dividend income of $0.5 million, or $0.10 loss per diluted share from the Company’s equity investment in Scorpio Tankers Inc. and a write-off of deferred financing costs of $1.7 million, or $0.03 loss per diluted share, related to the refinancing of existing debt (see discussion below, “Debt”). For the same period in 2017, the Company’s GAAP net loss was $1.1 million, or $0.01 loss per diluted share. Total vessel revenues for the fourth quarter of 2018 were $65.2 million, compared to $51.1 million for the same period in 2017. Earnings before interest, taxes, depreciation and amortization (“EBITDA”) for the fourth quarters of 2018 and 2017 were $23.3 million and $22.9 million, respectively (see Non-GAAP Financial Measures below). For the year ended December 31, 2018, the Company’s GAAP net loss was $12.7 million or $0.18 loss per diluted share, including a non-cash loss of $7.7 million and cash dividend income of $0.5 million, or $0.10 loss per diluted share from the Company’s equity investment in Scorpio Tankers Inc. and a write-off of deferred financing costs of $3.8 million, or $0.05 loss per diluted share, related to the refinancing of existing debt. For the year ended December 31, 2017, the Company’s GAAP net loss was $59.7 million, or $0.83 loss per diluted share. Total vessel revenues for 2018 were $242.5 million, compared to $162.2 million for 2017. EBITDA for the years ended December 31, 2018 and 2017 were $100.6 million and $35.3 million, respectively (see Non-GAAP Financial Measures below). While the results for the year ended December 31, 2018 did not include any non-GAAP adjustments to net income, the Company’s 2017 GAAP net loss included a loss/write-off of vessels and assets held for sale of $17.7 million and the write-off of deferred financing costs on the credit facility related to those specific vessels of $0.5 million. Excluding these items, the Company’s adjusted net loss for 2017 was $41.6 million, or $0.57 adjusted loss per diluted share. Adjusted EBITDA for 2017 was $53.5 million (see Non-GAAP Financial Measures below). As of January 25, 2019, the Company had approximately $74.3 million in cash and cash equivalents. During the fourth quarter of 2018, the Company repurchased a total of approximately 4.5 million shares of the Company’s common shares under the then existing share repurchase programs at an aggregate cost of approximately $27.0 million, or an average cost of $6.05 per share, which was funded from available cash resources. There have been no share repurchases since December 31, 2018. As of January 25, 2019, $24.8 million remained available under the then existing share repurchase program. On January 25, 2019, the Company’s Board of Directors authorized a new share repurchase program to purchase up to an aggregate of $50.0 million of the Company’s common shares. This new share repurchase program replaced the Company’s previous share repurchase program that was authorized in October 2018 and that was terminated in conjunction with the authorization of the new share repurchase program. The specific timing and amounts of the repurchases will be in the sole discretion of management and may vary based on market conditions and other factors. The Company is not obligated under the terms of the program to repurchase any of its common shares. The authorization has no expiration date. In the fourth quarter of 2018, the Company’s Board of Directors declared and the Company paid a quarterly cash dividend of $0.02 per share totaling approximately $1.5 million. On January 25, 2019, the Company’s Board of Directors declared a quarterly cash dividend of $0.02 per share, payable on or about March 15, 2019, to all shareholders of record as of February 15, 2019. As of January 25, 2019, 71,217,258 shares were outstanding. On October 12, 2018, the Company invested $100.0 million in a related party, Scorpio Tankers Inc. (NYSE:STNG) (“Scorpio Tankers”) for approximately 54.1 million, or (as of October 12, 2018) 10.9%, of Scorpio Tankers’ issued and outstanding common shares. The investment was part of a larger $337.0 million equity raise through a public offering of common shares by Scorpio Tankers. The Company measures its investment in Scorpio Tankers based on the quoted market price of Scorpio Tankers’ common stock, discounted for a temporary lack of marketability as at December 31, 2018 pursuant to the terms of the lock-up agreement entered into by the Company at the time of the investment. The lock-up agreement expired on January 7, 2019. At December 31, 2018, the Company recorded a $7.7 million non-cash loss and $0.5 million cash dividend related income from the investment in Scorpio Tankers, which were recorded in Investment income (loss) and Dividend income, respectively, on the Consolidated Statement of Operations. On January 18, 2019, Scorpio Tankers effected a one-for-ten reverse stock split and as such the Company now owns approximately 5.4 million common shares of Scorpio Tankers. On January 25, 2019, the fair value of the Scorpio Tankers’ common stock owned by the Company was approximately $110.4 million. In November 2018, the Company entered into an agreement with third parties to purchase exhaust gas cleanings systems (“scrubbers”) for 18 of its vessels in 2019 and for 10 of its vessels in 2020. The total value of these agreements is estimated to be $41.9 million. The systems that are being fitted are of ‘hybrid ready’ design, which allows them to be upgraded to a ‘closed loop’ configuration at a future date. As part of the agreement, the Company also has an option to purchase exhaust gas cleaning systems for up to 18 additional vessels in 2020. The Company is in discussions with its existing lenders, as well as leasing companies, to provide secured financing for substantially all of the estimated total cost of the scrubber installation program as well as to provide additional operating liquidity. These discussions are ongoing, however the Company expects to be able to make announcements within the first quarter of 2019. 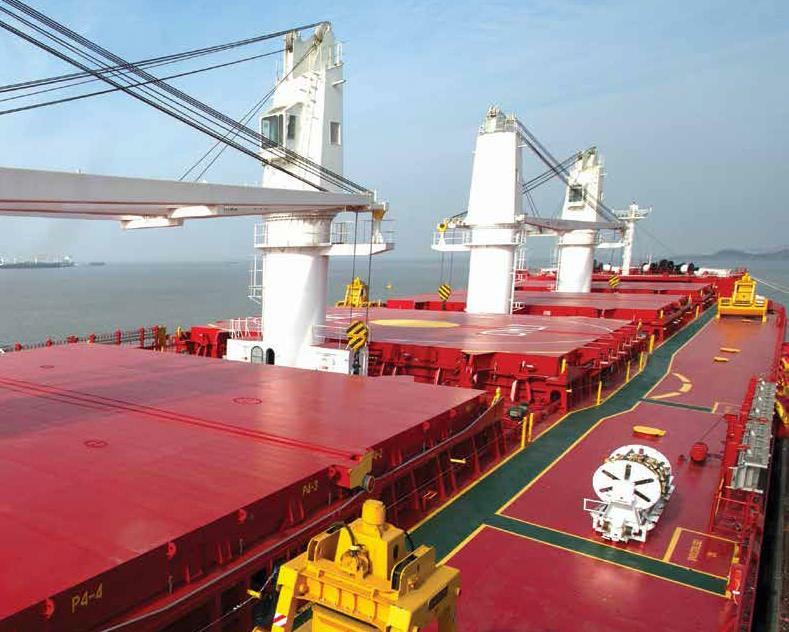 On October 3, 2018, we entered into a senior secured credit facility for up to $34.0 million with a leading European financial institution, or the “$34.0 Million Credit Facility,” to refinance up to 62.5% of the fair market value of two Kamsarmax bulk vessels (SBI Jive and SBI Swing). The loan facility, which is comprised of a term loan up to $17.0 million and a revolver of up to $17.0 million, has a final maturity date of seven years from signing date and bears interest at LIBOR plus a margin of 2.35% per annum. This facility is secured by, among other things, a first preferred mortgage on the two vessels and is guaranteed by each of the vessel owning subsidiaries. On October 5, 2018, the Company drew down the entire $34.0 million available on this facility. During October of 2018, the Company repaid approximately $23.1 million of our $330.0 Million Credit Facility as two of the Kamsarmax vessels previously financed by this loan are now financed under the $34.0 Million Credit Facility. During November of 2018, the Company repaid an additional approximately $61.7 million under this credit facility upon the closing of the $90.0 Million Credit Facility discussed below. On November 16, 2018, we closed a financing transaction with an unaffiliated third party for the sale and leaseback of the SBI Hermes, a 2016 Japanese-built Ultramax vessel, for consideration of $20.5 million. As part of the transaction, the Company has agreed with the buyer to bareboat charter the vessel for a period of five years at $5,850 per day. The transaction also provides the Company with an option to repurchase the SBI Hermes beginning on the third anniversary of the sale until the end of the bareboat charter agreement. If converted to floating interest rates, based on the expected weighted average life of the transaction, the equivalent cost of financing at the then prevailing swap rates would have been LIBOR plus a margin of 1.43% per annum. During November of 2018, the Company repaid approximately $8.8 million on its $27.3 Million Credit Facility as the SBI Hermes, an Ultramax vessel that was previously financed under this credit facility, is now financed under our $20.5 Million Lease Financing – SBI Hermes. On November 8, 2018, the Company entered into a senior secured credit facility for up to $90.0 million with Nordea Bank Abp, acting through its New York branch, and DVB Bank SE. The loan facility, which has a final maturity date of five years from the signing date and bears interest at LIBOR plus a margin of 2.35% per annum, is being used to finance up to 60% of the fair market value of six Ultramax dry bulk vessels (SBI Orion, SBI Hyperion, SBI Tethys, SBI Hercules, SBI Samson and SBI Phoenix). This facility is secured by, among other things, a first preferred mortgage on the six vessels and is guaranteed by each of the vessel owning subsidiaries. On November 13, 2018, the Company drew down the entire $90.0 million available on this facility.